Join James D’Silva in Italy for the workshops! 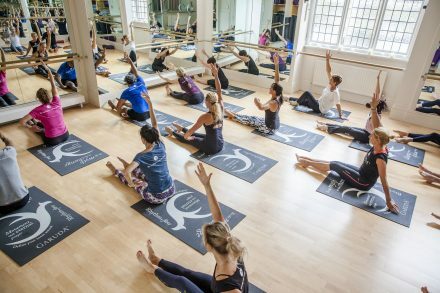 Garuda Foundation Matwork is a Pilates-based system that builds movement understanding and confidence gradually in the body. This cleverly devised system draws on the ancient martial arts, yoga, principles of Pilates and the beauty, grace and strength of dance. Rhythm and flow are paramount to this organic system and the elegance of alignment draws on a deeper understanding of weight placement.Dancers greatly benefit from these principles linking this movement method to their professional training. Moving away from traditional Pilates, Garuda presents different movement possibilities through its vast repertoire and promotes innate confidence and elegance to the moving form.Using the reformer as a tool of movement expression, Garuda explores a practice that is challenging in strength, endurance, flexibility and coordination. This workshop combines the seated & standing syllabuses in one intensive program, focusing on strength, stability, balance and joint mobility. The movements heal & rejuvenate, working intensely within the fascial lines of the body. At the same time the limbs are constantly challenged through functional training, complex moves committing the core to supporting the frame. This contemporary barre workout incorporates the physicality and grace of dance.Different aspects of yoga asana are brought in to establish alignment and stretch in the body.Balance and strength work side by side to create a sense of length and flow.The work moves from remedial to advanced and rhythm and flow are paramount to this technique.Different strength bands are introduced to facilitate and challenge the upper torso, making Garuda Barre an all aerobic body work out.Each moment is a celebration of movement and Garuda barre triumphs like no other.